It was 13:30hrs and Patrolman Richard Connors of the Florida Highway Patrol was resuming his tour of duty after having lunch at the Cosmos Diner on East Atlantic Boulevard in Pompano Beach, Florida. Heading west on East Atlantic Boulevard, he took the entrance ramp south on Route 95. As he entered the highway he observed a late model BMW driving erratically, swerving in and out of traffic at a high rate of speed. 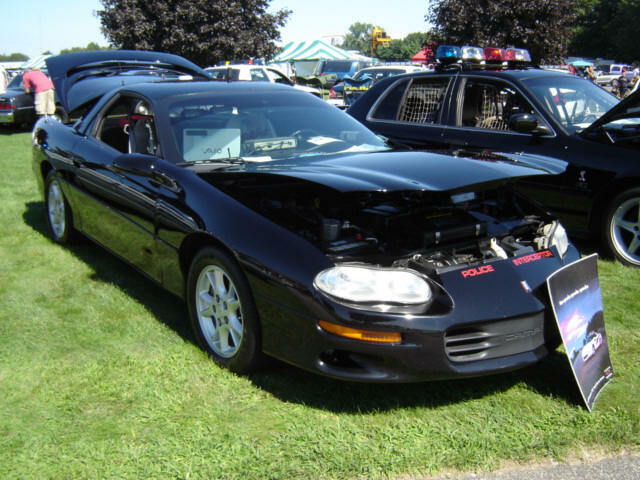 Patrolman Connors pressed the accelerator of his cruiser, a 2002 Chevrolet Camaro B4C, to the floor and hit the controls for the squad’s over-head lights and siren. "Badge 8", he spoke into his radio’s microphone. FHP Dispatch quickly came on air, “Badge 8 go ahead”. "Badge 8 signal 12 in pursuit, Route 95 Southbound with a Black BMW Florida Registration Charlie, 1 4, Whiskey, Frank, Ocean." The Camaro’s 5.7L LS-1 Corvette inspired motor quickly caught up to the European sport sedan’s 90mph speed in just under 11 seconds. "Badge 8, I’ll be out with that vehicle Route 95, just North of Exit 33". "10-4 Badge 8", dispatched replied. In 1979, 12 Chevrolet Camaros were tested by the California Highway Patrol to determine their potential as traffic enforcement vehicles, but it wasn't until 1991 that Chevrolet equipped the Camaro with the official B4C Special Service Package and was made available as a traffic enforcement car. Originally powered by 305 and 350 TPI engines, the '93 model year brought the fourth-generation LT1 cars to market. 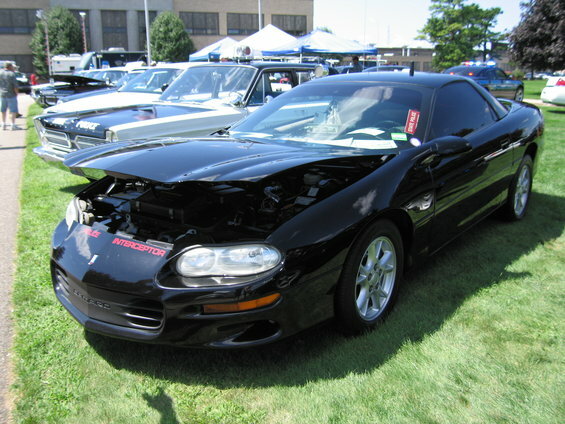 In '98, the LS1 replaced the Gen II small-block and served through the remainder of the model's run until GM, unfortunately, discontinued production of the F-body Camaro in 2002. The LS1 could also be paired with the six-speed standard or four-speed 4L60E automatic transmission. In 2002 there were a total of 42,098 produced in the United States. 538 of these units were automatics. Our feature car is owned by Angelo Appi of East Haven, Connecticut. Angelo is a 42-year-old project manager for Webster Bank Security in charge of over 30 branches throughout Connecticut. Angelo tells us that he is also an Instructor with the CT Red Cross and works for his father part time at Connecticut Firearms Safety Company located in North Haven, Connecticut where Angelo helps train security officers in preparation for their CT Guard license. Angelo purchased his 2002 Chevrolet Camaro B4C Car in October 2007 from a dealer in Florida. “My car was one of the last two cars that were in service and turned over to the Tampa Machinery Auction in Tampa, Florida”, Angelo says. The Florida Highway patrol purchased 200 of the total 708 B4C models manufactured in 2002. Less than a 100 of the retired B4C Camaros made it to the public. Most of them were involved in accidents or were used for parts to repair other B4C’s still in service. Angelo has the original title that came from Chevrolet’s Oshawa plant in Canada. The car was delivered to the Department of Public Safety in Florida with 10 miles on it. On the title it lists the vehicle as: Primary Brand: “POLICE” and Use: “POLICE”. The Title displays the original license plate number that was assigned to the car and the troop in which the car was stationed, Troop A in Pensacola, Florida. He also has the original FHP maintenance book with all oil changes and scheduled maintenance documented. "These cars were well taken care of", says Angelo. The car has not, as of this writing, been restored to original FHP specs. The Onyx Black paint is all original except for the roof which was originally cream color and then painted Onyx black before it was made available through a dealer to the public. “Originally FHP painted the roof and sail panels of their Camaros, Chevrolet’s Almond Cream color, which is the standard paint color for the Florida Highway Patrol vehicles” says Angelo. The black-and-cream paint scheme is actually camouflage to help the vehicle blend in with the road surface (Black) and parched grass medians (Cream). According to the Florida Attorney General's office, the cars cannot be sold to the public in the FHP Onyx Black and Almond Cream color combination. Furthermore, the public cannot operate or even tow the vehicle if it has this color combination within Florida jurisdiction even after restoration. Hobbyists beware. If you do, you could very likely be the subject of a misdemeanor ticket by the FHP itself. Our feature car came direct from the factory with a Generation III C-5 5.7L LS-1 Corvette inspired motor rated at 310hp at 5,200rpms and 340lbs of Torque at 4,000rpms, along with Chevrolet’s LS6 intake. This particular B4C also came with the 4L60E automatic overdrive transmission and aluminum drive shaft. The bodies of the B4C’s are unique in that the front fenders are made of a Polymer Composite plastic. The Polymer is very light and is an extremely flexible material. This, along with the fiberglass doors and rear hatch construction, help to bring the curb weight of the car down to a plausible 3,462 lbs. The rear quarter panels as well as the sail panels and roof line are steel to help support the body and keep things rigid. Brakes on these models were Corvette 4 piston calipers with 12" Rotors. The 2002 B4C also incorporates the 1LE Suspension System, which is comprised of a 35mm front stabilizer bar, a rear 21mm stabilizer bar with reinforced stabilizer brackets and special built end-links, Koni double-adjustable shocks were also installed. The 2002 B4C package also came with Linear-rate front springs rated at 360 lbs per inch and progressive-rate rear springs rates at130 to170 lb.-per-inch, front lower control arms and rear trailing arms both had higher durometer bushings as well as a heavy duty Panhard bar with higher durometer bushings. Chevrolet issued rubber used on the B4C models were Goodyear Eagle RS-A all-season P245/50ZR16 M+S performance (maximum speed rating) tires. The net result is racecar functionality with near-Original Equipment levels of vibration and noise damping. Angelo has added a Whelen Blue light SlimLighter LED warning light behind the front windshield concealed behind window tint. Radios include a Realistic 300 Channel Scanner, RELM 6 Channel UHF Radio, and Realistic CB Radio. Radar is a Kustom Signals X Band unit. He also Installed a swivel lap top mount for the Sony Vaio laptop computer that is in the car along with a telescopic map light. The equipment is not what the FHP ran in their vehicles, but Angelo tells us he will be upgrading his equipment soon to FHP standards. All in all, Angelo’s B4C is an outstanding example of what was arguably one of the best pursuit vehicles made by GM.